Fast label and barcode printing in one compact unit. 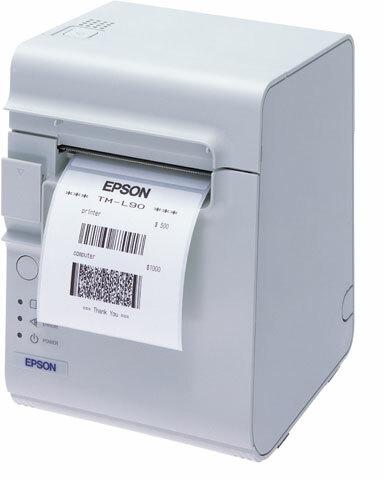 The Epson TM-L90 offers fast label and barcode printing in one compact unit. With its software utility you can quickly design custom labels and barcodes and print in one- or two-colors on a variety of print stocks. The TM-L90 supports continuous printing on liner labels and cost-effective one- and two-color thermal labels are available from Epson in a variety of sizes. 6 ft. Parallel printer cable. Replaces (Part# PCM-1100-06). AT1L-30030, CONSUMABLES, TM-L90 LABELS, 3.00" x 3.00" (76 MM x 76 MM), ROLL WIDTH 3.15" / 80 MM, 425 labels/roll, 50 ROLLS PER BOX, single roll. 3.0" x 3.0" Paper label for the TM-L90. 425 labels/roll, 10 roll case. 3.0" x 2.0" Paper label for the TM-L90. 600 labels/roll, 10 roll case. 3.0" x 1" Black paper label for the TM-L90. 10 roll case. The Epson C31C412A8801 is also known as Epson POS Products	EPS-C31C412A8801	.